A (whiskey-novice) friend of mine recommended I check out Rokerij in my quest for good whiskey in the desert. Being thirsty one night I decided to head down and check it out. Pronounced "ROW-ker-ee" (I think -- when I asked a staff member about the pronunciation this was the response, "I don't know. It's a Dutch word, and that's how I pronounce it, but I can't say confidently that's how it's pronounced"), Rokerij is about as close to a speakeasy as I've found so far in the Valley. It's located in the basement beneath Richardson's on 16th St. north of Bethany Home. While there's a sign along 16th St., once you arrive in the parking lot you either have to know where you're going, be led by someone who knows, or be that guy aimlessly walking around before ultimately asking the valet where this illusive place is. Fortunately, my whiskey-novice friend had been before; he led me around to the front of Richardson's, but then led me down an unmarked set of stairs to an unmarked door. Now, if you've been to a speakeasy anywhere else, you'll recognize this as a good sign. The harder the place to find, and the less-clearly-marked it is, (usually) the better the whiskey selection is. Sadly this was not the case at Rokerij. We took a seat at the bar, and I asked for a liquor menu. 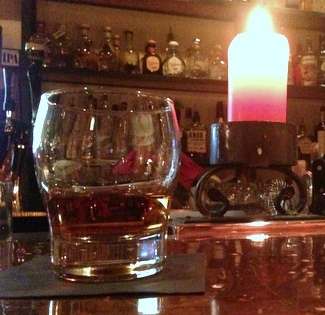 There was none to be had, so I had to go through the entire whiskey selection with the barkeep, one bottle at a time. Many bottles were behind others, and with no menu I had no way of knowing what they were without this somewhat annoying process -- though, in the end it didn't take very long given Rokerij's thin whiskey selection. On the top shelf they had the obligatory bottle of Johnnie Walker Blue (they also had red and black, but not gold or green). Also on the top shelf was, comically, a bottle of Bushmills 10; when Bushmills is a top-shelf whiskey, it's probably time to leave. However, having come all that way, and with the whiskey-novice ordering food, I settled on a pour of Basil Hayden's (not having had it before). I'll review it in depth later, but the short version is don't try Basil Hayden's. For what it's worth I was given a healthy pour for the reasonable price of $11.